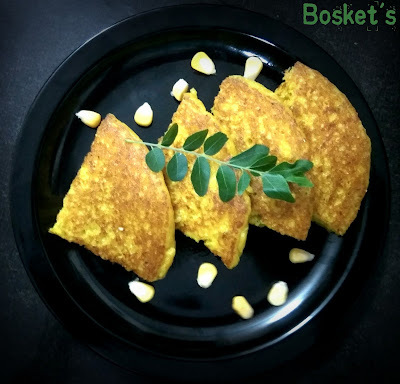 "Heavenly food Designed by BosKet (Boskey & Ketul)'s Kitchen with Love..."
In a mixing bowl, mix all dry ingredients well. Add Curd and mix well. Prepare the batter with Dropping consistency by adding required water. Season it with all spices. Mix well. Keep it aside for half an hour. Add Baking Soda and mix. On a non-stick pan apply oil. Once it's heated, add pinch of sesame seeds. Pour the batter ( 1 Full Spoon ). Spread it well to make it round. Fry it till brown on both the sides. Serve it HOT with any dip, chutney or tomato catch up. All Rights Reserved to © BOSKET Cullinery. Simple theme. Powered by Blogger.